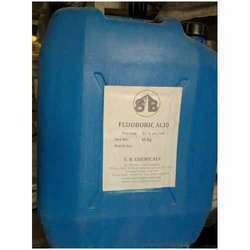 Hydrofluosilicic acid of various concentration are available for electroplating and electronic processing. 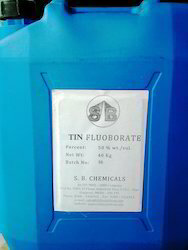 We are one of the most trusted Tin fluoborate manufacturer and supplier which is prepared in a highly closed system with zero chance of any impurities. We use high quality raw material ensuring optimum efficiency and effectiveness of the chemical. It has very low sulphate and chloride content (less than 100 ppm) for tension free electroplating and other electrolytic uses. 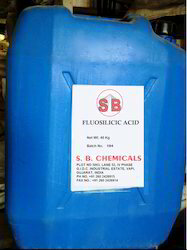 Fluoboric Acid 52% wt./vol. is prepared in colorless or pale yellow liquid with molecule weight of 87.81. It has solubility of 4 g/100 ml water @ 15 (59 ºF) and Boiling Point of 130 ºC. We are one of the trusted Fluoboric Acid Manufacturer and Supplier which is used in the pharmaceutical industry. Concentration as HBF4 52% Min. Free Boric as H3BO3 3% Max. Sulphate as SO4 0.05% Max. Lead as Pb 0.003 Max. Iron as Fe 0.02% Max. In 38kg HMHDPE carbuoys or as per customer requirement. In Pharmaceutical industry for manufacturing bulk drugs. In manufacturing of inorganic fluoborates. Looking for Electroplating Additive or Electronic Chemicals ?